We don’t usually pay a whole lot of attention to Black Friday deals, but here’s one that we thought might actually be worth standing in line for: a special edition, double A-side 7-inch vinyl record featuring tunes from the legendary John Mayall and his former Bluesbreakers band member Walter Trout. A Black Friday Record Store Day exclusive, the record offers a track off each of the artists’ latest albums. While neither of the songs is exactly what you might consider uplifting in their lyrics – Trout’s hard-driving “Willie” (The Blues Came Callin’) was inspired by “the many times I have been ripped off by many different people in the music business in my past…it is about the experience of trusting somebody to handle your business affairs, and then having them steal from you and exploit their position,” while Mayall’s “World Gone Crazy” (A Special Life) is perhaps one of the smoothest-sounding political statements you’ve ever heard, addressing such weighty topics as religious fighting, irresponsible politicians, and other chaos in the world today – musically, the songs are strong ones, particularly on vinyl. 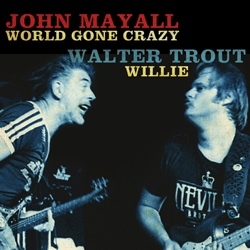 Even with Mayall and Trout having collaborated as recently as Trout’s latest album (on which Mayall played keyboards on two tracks), it’s great to see these two masters paired in such a way, making this a terrific gift for the blues-rock and/or vinyl collector in your life. If, that is, you’re fortunate enough to get your hands on one; with only 1,000 copies having been pressed and shipped to retailers, you may want to make your local record store one of the first stops along your Black Friday adventures. And while you’re there (and since it’s officially the start of Christmas shopping season), you might as well also pick up a copy of the Bessie Smith exclusive release from Legacy Records. This one features the Empress of the Blues singing “At The Christmas Ball” with a B-side of “Jazzbo Brown From Memphis Town” on a holiday-appropriate red 7-inch 45 RPM vinyl. This entry was posted in Albums and tagged Bessie Smith, John Mayall, Walter Trout. Bookmark the permalink.